Atomic force microscopy (AFM) or scanning force microscopy (SFM) is a type of scanning probe microscopy (SPM), with demonstrated resolution on the order of fractions of a nanometer, more than 1000 times better than the optical diffraction limit. The information is gathered by "feeling" or "touching" the surface with a mechanical probe. Piezoelectric elements that facilitate tiny but accurate and precise movements on (electronic) command enable very precise scanning. The Dimension 5000 scanning probe microscope provides semiconductor, data storage device, and optics manufacturers the ultimate automated tool for large-sample metrology and imaging. 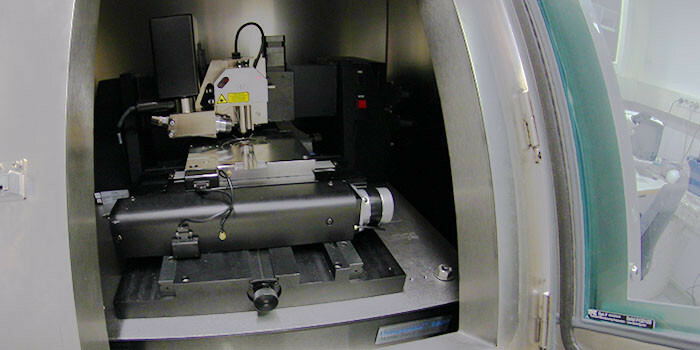 This SPM is capable of measuring up to one hundred areas on samples up to 350mm in diameter. A comprehensive range of AFM and STM techniques enables the Dimension 5000 to detect faults and measure roughness and other features in three dimensions without any sample destruction, pretreatment, or modification. The system has a XYZ open-loop scanning head. The NanoScope V controller delivers reliable, high-speed data capture of high-pixel-density images (5120 x 5120) union allowing researchers to record and analyze tip-sample interactions that probe nanoscale events at timescales previously inaccessible to SPM. The NanoScope V enables up to eight images to be simultaneously displayed/captured with unprecedented signal-to-noise ratio. The controller incorporates three independent lock-in amplifiers, provides thermal tune measurements of cantilever resonances up to 2 MHz, affords easy access to most input and output signals through front-panel BNCs, and supports input data from an external source.